Fathers Are The Priests Of The Home! IV. Make sure you know what your children are being taught at school regarding morals and values. All teachers teach “in your place” as you and your wife are the primary educators of your children. If objectionable subjects or materials are being taught in the classroom, you must stand strong. The primary place for Christian morals and values to be taught and practiced is within the family home – your home, which you oversee. This is an awesome responsibility given both to you (as the “head” of your household) and to your wife (as the “heart” of your household). Realize that your headship is to be modeled after the headship of the wise and prudent king who loves and rules over his kingdom and its inhabitants. Your headship is not to be modeled after the headship of the master who rules over his slaves. You do not exist as the head of your family to have your needs met, but rather to have your family’s needs met. Your headship is not about you being served, but rather about you serving. Your headship is about sacrificial love and service. As head of the family, you are called to great responsibility. Many husbands and fathers want headship without the responsibility it demands. Dare to discipline with love and firmness. The wise and prudent king loves all of the subjects within his kingdom and wishes to see them prosper in the fullness of beauty and Truth. He desires to bring them all to the fullness of Truth and prosperity. Jesus Christ Himself is the Head of His Church; He is the King of Kings and Lord of Lords. St. Augustine calls the family the “domestic church.” You are the “head” and “king” and “lord” of this domestic church: “The place and task of the father in and for the family is of unique and irreplaceable importance. In revealing and in reliving on earth the very fatherhood of God (cf. Ephesians 3:14- 15), a man is called upon to ensure the harmonious and united development of all the members of the family” (Pope John Paul II, Familiaris Consortio [The Role of the Christian Family in the Modern World], 25). V. Pray with your wife and regularly so. Try to keep a simple, but sincere spiritual journal and share it with her, even if your entries are just short, inspirational sentences. Trust the Lord to guide, purify and sanctify your relationship with your wife. She is the “heart” of the home. Reverence her as such. Love her with the same love and affection Christ has for His Church. Remember that your sons will grow up to relate to women much in the same way that they saw you relate to your wife. Similarly, your daughters will learn from their father what to expect from men in a relationship. Share with your wife her burdens, her sorrows and her joys. Ask the Lord for the strength to love her with the same love and purity with which He loves His Bride, the Church. VII. 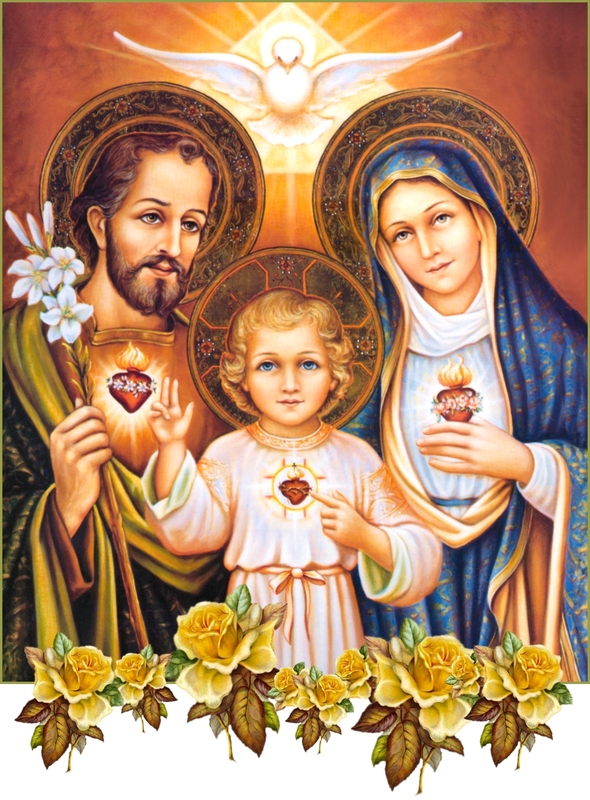 Consecrate your home to the Sacred Heart of Jesus. Set up a “prayer corner” within the home in the room where the family most gathers. In this room should be an “altar-table.” On this table place a Bible, a good condensed version of the Lives of the Saints and a copy of the Catechism of the Catholic Church. On or around this table also place images (statues, pictures or icons) of the Sacred Heart of Jesus and the Immaculate Heart of Mary. The daily family Rosary is a powerful prayer. If your children are still small, pray only a decade of the Rosary and/or vary it daily with the Chaplet of Divine Mercy. A wonderful, fixed time for daily family prayer and spiritual reading (say, a total of just 15 or 20 minutes) is immediately after supper each evening. Included here could be the Readings from the Mass of the day; purchase a daily Roman missal for this. Again, remember that you are the priest of the home. As such, you are called to be a true leader. A child will remember well into his adult life these early family practices of the Faith. They will never be forgotten. A father must be the first Christian witness to his wife and children. This is both a duty and a responsibility. Also, be sure to foster the use of sacramentals among your family members. Sacramentals are “sacred signs which bear a certain resemblance to the Sacraments and by means of which spiritual effects are signified and obtained through the prayers of the Church” (Catechism of the Catholic Church, Glossary). Examples of sacramentals include the Sign of the Cross, holy water, enrollment in the Brown Scapular of Our Lady of Mt. Carmel, religious medals, blessings, pilgrimages, processions, the Stations of the Cross, sacred art, rosaries and the veneration of relics. While sacramentals do differ from the seven Sacraments, they are still very important in the life of a Catholic Christian. Also, promote visits to the Blessed Sacrament with your family members, for instance, when in town running errands. IX. Pray that each one of your children may answer the call to the vocation that Almighty God has chosen for him or her from all eternity. Never ask your children, “What do you want to be?” Rather, ask each child, “What do you think God is calling you to be?” Help them to discern their states-in-life, whether it be singlehood, the married state or consecrated religious life. Have this discussion often with your children, especially after they reach the age of 15.